This is part 1 of 4 of a post on how to iterate with RUP. The introduction to this post can be found at ScrumUP Fairytale - Part 4. The term “Ready to Poker” means that the team is ready to estimate a story from the Product Backlog in such detail that they can accurately forecast if its implementation will fit in the upcoming Sprint. Stories to be prepared by the team so they can be pokered are the ones at the top of the Product Backlog (and sometimes explicitly planned in the Sprint Backlog). The best way to get a story Ready to Poker is for the team to be actively involved in preparing this story for implementation. Team members playing the role of Analyst, Developer and Tester work together with Subject Matter Experts, who represent the business. Starting point for these activities is the short description of a Use Case from the Use Case Model, describing what the user wants to do with the system and why. The activities involve detailing requirements so the team knows what the user wants, preparing test cases so the team knows how the solution will be accepted and do some designing so the team knows how to get to a solution. In Figure 35 through Figure 38 we build up a workflow explaining a RUP based process you can follow to get Ready to Poker. A key to the symbols used in this workflow can be found in here. The Analyst has several sessions or workshops with the relevant Subject Matter Experts. His starting point is the brief Use Case description in the Use Case Model, together with relevant user interface and navigation guidelines found in the Navigation Map. We briefly introduced these work products in the blog post Gather Requirements the Agile Way and treat them more fully in an upcomming blog post No Magic. Assume for this moment that they, as the phrasing is, ‘magically appear’. This is part 3 of 3 posts on Scrum. Part 2 of this post is Learn the Scrum Rules of Play. An important part of being transparent is played by having a transparent way of working. This helps alignment in the team and with its surroundings and enables discussions on improvement. In the next few postswe will introduce two tools for recording and enabling discussions on a way of working: the workflow and the collaboration matrix. 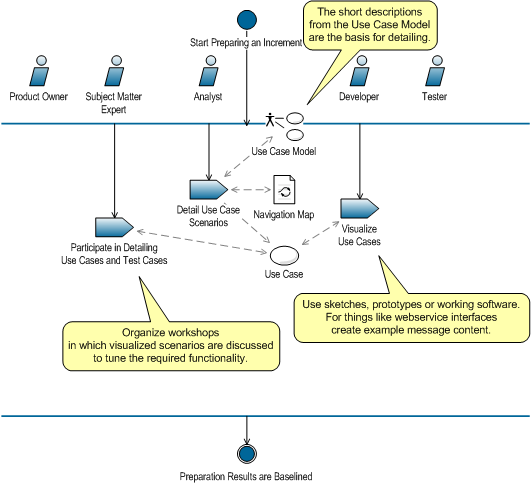 A workflow provides a high level, semi sequential representation of (a part of) a process. It brings together roles, tasks and work products in a concise manner. A collaboration matrix gives an overview of knowledge and skills needed for certain work products. Let’s start with a workflow of a process we already know: the Scrum process. In Figure 31 through Figure 34 we gradually build up a workflow of the Scrum Process. 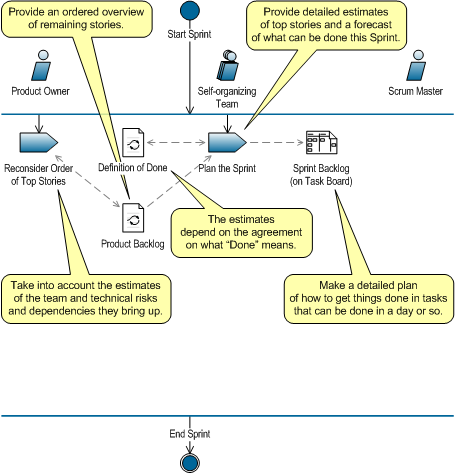 Furthermore we show explicit activities for the Product Owner and Scum Master to clarify their role in the Sprint. 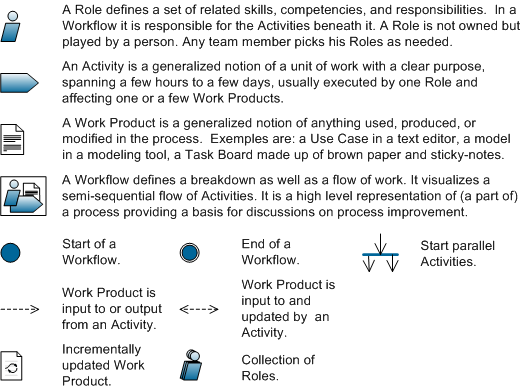 A key to the symbols used in this workflow can be found in Appendix C.
In the blog post Learn the Scrum Rules of Play we saw a number of Scrum elements that help the business and the team to be transparent. The Product Owner role provides the team with a single point of contact for decisions about requirements and order of implementation. The Product Backlog gives a clear overview of the work remaining toward the goal of the release or project. The Definition of Done shows which criteria must be met before a story will be delivered as part of a Usable Increment. The Sprint Backlog gives a clear overview of what the team forecasts to get done in a Sprint and how they plan to do that. Figure 31 shows these Scrum elements and their connection.